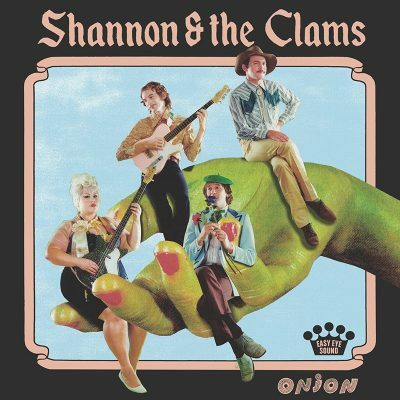 Onion, Shannon & the Clams’ fifth studio album, feels like a trip back in time to the beach, where people wore weird swimsuits and had names like Gidget. What didn’t feel so old-timey was the pure garage attitude, even on the ballads, exuding from Shannon Shaw and Cody Blanchard, both on the mic and with the strings. Onion is a lot of fun, from beginning to end, whether you dig the toe-tapping, late ’50s/early ’60s girl group combined with surf rock sounds or the gravelly soul oozing from the pieces with slower tempos. I’ve been a little hesitant over the years to dive into something labeled retro, or considered throwback in any way, especially considering all of the stuff out there that sounds entirely derivative. But Shannon & the Clams really wail: They can play, and their songwriting ability is top notch. Yes, the group brings a vintage vibe, but it doesn’t sound like they are doing it because it’s all the rage. The album begins with “The Boy,” a good track and the perfect choice to garner listeners’ attention. The only problem for me is I hit repeat a lot when I like a song, and it took me a bit to get on to the next one. There were a few tracks like that throughout the album, some of which will likely be on my playlists for some time. I love “Backstreets.” Blanchard’s vocals are convincing, his plight painful but hopeful all at once—a tough feat to pull off on a track with a grilling surf guitar solo between verses. One of my favorite songs on the album is the title track, “Onion.” It’s got some poppy Beatles vibes and some Kinks for good measure. It’s right in the middle of the album too, seeming to be the pinnacle, something you can’t wait to get to and something that sticks with you while on the comedown. Onion isn’t as raw as some of the band’s earlier work, and some fans will likely pine for days gone by, but Shannon & the Clams have grown, refined their sound and truly mastered their niche. The production on Onion is stellar, with all kinds of intricate delights to add to what the band brings. The vocals are thrilling, the guitar work and bass lines are superbly on top of their games and the drums, expertly played by Nate Mayhem, are the backbone of the whole thing.